The fuselage, wings and wheels wear a base coat of Krylon Dull Aluminum. This was sealed with Future Floor finish to give the decals a smooth, glossy surface to which to adhere without "silvering." When dry the decals were sealed with another layer of Future. Then Norman applied a thin gray pin wash to highlight the molded-in details. All this was sealed with a topcoat mix of Floquil Crystal Cote and Flat Finish. The engine cowl was painted in Floquil Platinum mist with its rear edge highlight by Floquil Bright Silver. The tires are painted with Floquil Medium Gray. 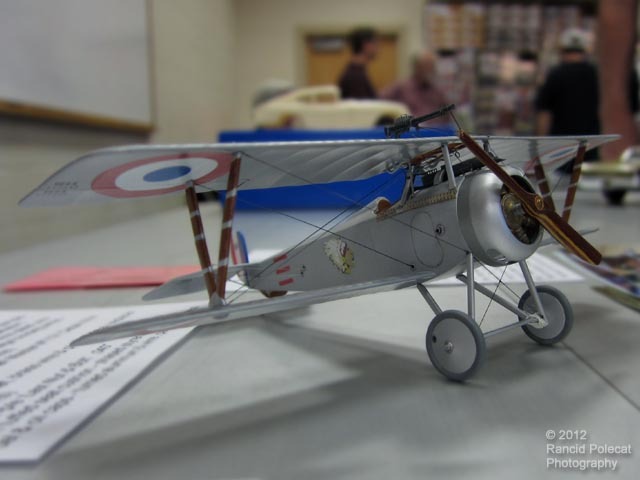 Norman decided to forego the kits rudder decals in favor of airbrushed red, white, and blue paints. He painted the kit propeller with Floquil Earth and Rosewood Stain topped by Gunze Clear Yellow to resemble the varnished laminated wood propellers of the day. The engine is painted in Floquil Platinum Mist with a Weathered Black wash and a Gunze Clear Orange and Yellow mix to represent burnt-on oil. He added aluminum wire throttle linkage and thin-wall brass tubing for the carburetor breathing tubes. The bungee cord shock absorbers are represented by genuine thinned elastic cord. The wheel nuts are .040" photo-etch pieces. The fuel and oil caps are turned aluminum and wire, painted Gun Metal.